It’s the end of the year, a time to reflect on what went wrong and how to fix things in our lives. Well, one GREAT effort we all can make is to be a bit more thoughtful about thinking. Information is not the same as KNOWLEDGE. We are barraged with information. Constantly. And I’d guess more than half of it is unsubstantiated, not quite right, or downright untrue. Knowledge takes more effort. It’s a consideration of the information and placing it into a framework of how the world is or a model of the way things work. Information can mislead as often as lead. Knowledge can be enlightening and is part of who you are. We can always use more knowledge. We can probably do with less information. Quality information is only what’s good for most of us (unless you are in a profession that can capitalize on bad information). Here’s where the skepticism comes in. We all follow news. News as reported by the media is often incomplete or wrong. News SHOULD help us build our knowledge about the world but we need some help in sifting out the wheat from the chaff in the media. 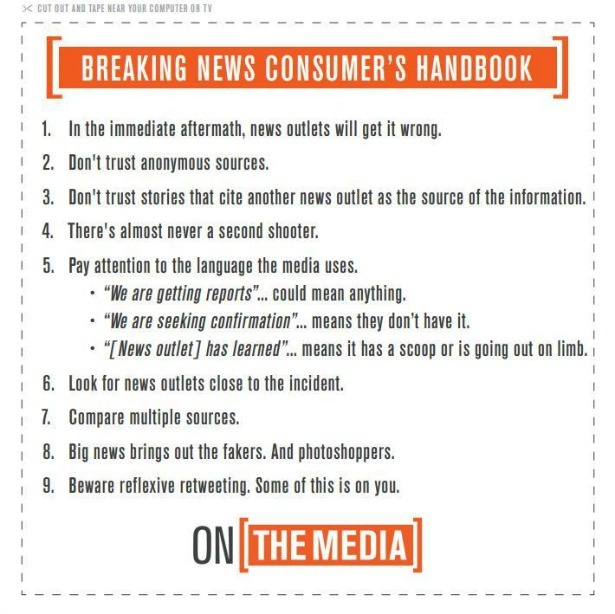 I’d like to recommend a Handbook: ON THE MEDIA’S BREAKING NEWS CONSUMER’S HANDBOOKS. There are several topic areas covered such as health news/fads, stock market and terrorism. Please check them out. Print them out. Memorize them! I enjoy On the Media. It provides me with a pre-packaged container of vetted information that I can easily incorporate into knowledge. The information in the container is solid and referenced. I like that. Quality references count. The handbooks provide a one-page guide to dealing with news of various sorts. The original Handbook is on the media, obviously. These nine items are CRITICAL in evaluating news information. Pay particular attention to 1, 2, 5, and 9. Beware of the first information that comes out or that from questionable sources, it’s probably wrong so don’t spread it as true. Think a bit and be skeptical. We may not have the whole story yet. We may not have the whole story EVER! We are overrun with bad information. Once that info is out there, WAY TOO MANY people simply accept it as true. Do your part, don’t pass on questionable information. (You can’t get that damn horse back into the stable once it’s out and galloping freely. 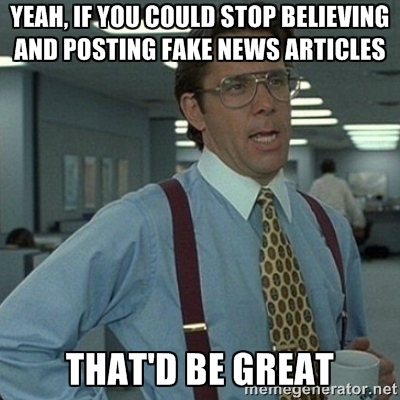 PLEASE don’t share garbage content from awful tabloid websites!) I know we humans are social and want to talk about things that get to us. But at least phrase it in a thoughtful way. Wouldn’t you rather get it right? 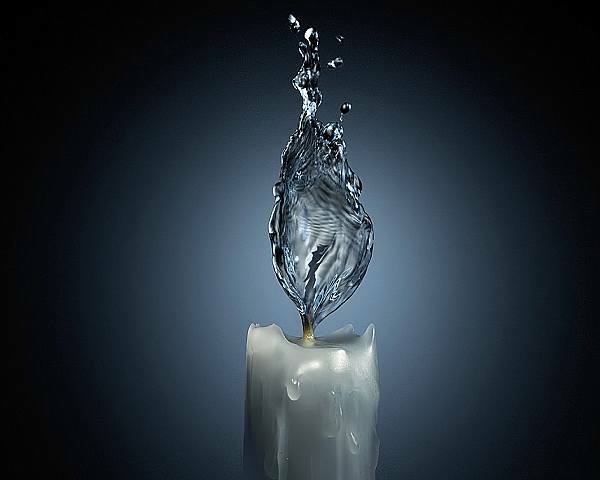 Wouldn’t you rather be enlightened than mislead? Let’s do better in 2016. Be critical of the news. All news. Think before sharing. Think about the information before accepting it as knowledge. Less nonsense and needless fear in society will be a major improvement. As a newspaper editor, I’ll put a caveat on No. 2. I’ve used anonymous sources myself. If it’s related to the White House, skepticism is highly warranted. But, in other cases? “Anonymous sources” are often whistleblowers. I’ve used them to expose bad construction and misspending on a school district bond issue and other things.